Do you want to upgrade your garage floor, renovate a rooftop deck, or transform a drab screened in porch into an upscale outdoor escape? When you consider the strength and upscale look of real hardwood, you'll agree that our Ipe deck tiles are the best deal online. Questions? Need a free quote? Contact us today to buy wood deck tiles. Give us the square footage of your project and we'll tell you how many deck tiles you'll need and how much you'll save by choosing our 20x20 tiles. Click and drag to rotate the tile. Use the mouse wheel to zoom in and out. Cumaru and Tigerwood deck tiles are currently only available in smooth surface profiles. 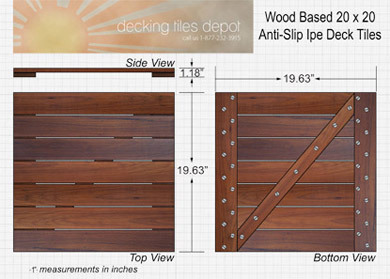 If you want anti-slip tiles, consider our Ipe deck tiles instead.